Plans are well underway for the return of the much loved Roundwood Festival 2018 running from Thursday 2nd August to Sunday 5th August. So keep these dates free and keep and eye on this space for more details of what’s on and where!! Kildare Wicklow ETB are currently advertising for grant funding under the community education programme. The Community Council previously facilitated courses on flower arranging, digital photography, IT and art. If you are interested in these or any other courses in the Roundwood area please email info@roundwood.ie. all suggestions welcome. The next meeting for those interested in the Baltynanima Pure Mile will take place at 8.30pm on tonight Wednesday 27th of June in Roundwood Parish Hall. All welcome. The results of the whist are as follows:- Top Score: Ann Wolohan; First Gent: Ann Gaffney: Second Gent: Mick Whelan; First Lady: Patricia Byrne; Second Lady: Catherine Doyle; First Half: Kitty Kennedy’ Second Half: Paddy O’Brien; Longest Sitting: Shay Brady & Lowest Score: Mary Pierce Raffle prizes were won by Pat Fisher, Catherine Doyle, Shay Brady, Margaret Kennedy & Paddy O’Brien. Next Whist is this Wednesday 4th July in The Parish Centre, Roundwood. Jenny’s Pre-School is now accepting enrollments for September 2018/2019. If you require any further information please do not hesitate to contact Jenny on 0868766301 or email us onjennyspreschoolmoneystown@gmail.com, or call into the Pre-School for an application form any morning. The next concert in our 2018 series will take place at 8 pm on Thursday 28 June in Calary Church. Sean Carpio (drums), Mikkel Ploug (guitar) Simon Jermyn (guitar), Jeppe Skovbakke (bass), and Joachim Badenhorst (reeds) will play a concert of original music that will speak about the places of its origin, including Calary, in order to present a complex yet nuanced concert experience transforming musical elements of speech into music. This an extremely exciting and innovative project and it will be wonderful to hear the performance which is the result of their work. Tickets are €18 and €15 for concessions and, to make a booking or for more information, please contact John (01) 2818146 or derekneilson@eircom.net. A 45 Card Game takes place every Tuesday night in Moneystown Community Centre starting at a new time of 830 pm for the summer months Teas served. All are welcome. This entry was posted in News & Events on June 28, 2018 by roundwoodiewicklow. A walk to the deserted village as part of the Pure Mile project will take place at 11am on Sunday 1st of July. The meeting point is on the road from Roundwood village to Lough Dan at the Wicklow Way junction at Lake Park (look out for the poster & balloons). 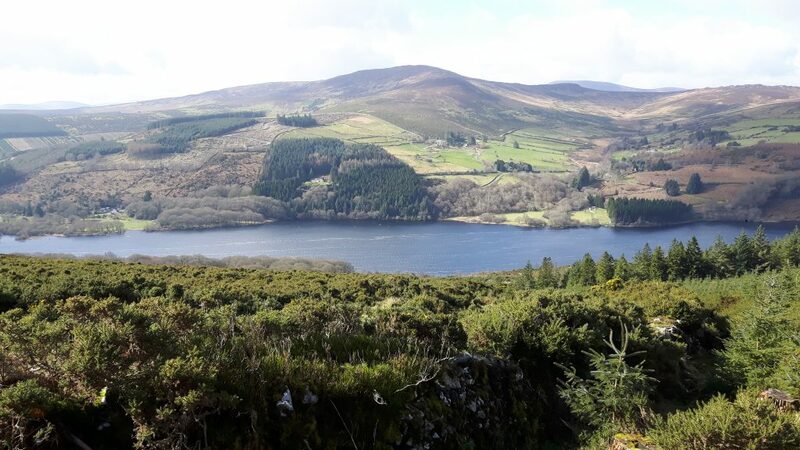 The walk will follow the Wicklow Way taking in some fantastic views and then veer off to the old ruins. Local guides will tell the fascinating history of the area. If it’s a fine day bring the kids and a picnic. There is limited parking available. All welcome. This entry was posted in News & Events on June 27, 2018 by roundwoodiewicklow. The Roundwood Active Retirement holiday will take place from the Monday the 24th September until the Friday 28thSeptember to The Tara Hotel in Waterford. Anyone interested should pay their deposit to Betty or Molly before the 1st July. Rebecca Delamere will be running Maths classes for Secondary School students in Roundwood Parish Hall. Classes will be available for 1st to 6th year students and are designed to focus on common areas that students struggle with. Guaranteed small class sizes and places are limited. For further information, please contact Rebecca on 0860650129orRebeccaDelamereMathsLessons@outlook.ie. This entry was posted in News & Events on June 18, 2018 by roundwoodiewicklow.